4-player versus & 3 single modes, 5 scenes, 17 tracks and 64 stages. New combat mode! For single & multi-play, feel the competitive " crashing" combat Vehicle Performance Upgrade! High quality force feedback with new turning & N2O system. Breaking Evolution-Tuning Shop system! 48 different car shapes & over 300 turning parts for millions combinations Powerful internet features! 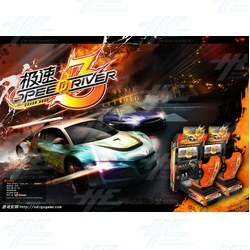 Instant ranking, motorcade system and more.SD3 Memory card for multi-game uses! Saving game data with SD3 card, multi-game use support. 4-player versus & 3 single modes, 5 scenes, 17 tracks and 64 stages. New combat mode! For single & multi-play, feel the competitive " crashing" combat Vehicle Performance Upgrade! High quality force feedback with new turning & N2O system. Breaking Evolution-Tuning Shop system! 48 different car shapes & over 300 turning parts for millions combinations Powerful internet features! Instant ranking, motorcade system and more.SD3 Memory card for multi-game uses! Saving game data with SD3 card, multi-game use support.